Give your vintage disk controller a boost with DOS Adapter. 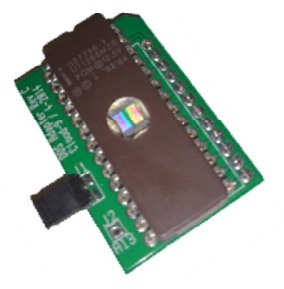 This product adapts 2764 and 27128 28-pin EPROMs to controllers that have antiquated 24-pin ROM sockets that accommodate the rare and hard to find 68766. Not only does DOS Adapter provide you with the ability to use 28-pin ROMs, it also allows you to switch between two 8K banks when using a 27128 EPROM. Now you can have the standard Disk BASIC ROM in the lower 8K bank, and a customized DOS in the upper 8K bank. All selectable via a jumper! Please note that the EPROM is NOT included. > Adapts 2764 and 27128 EPROMs to 24-pin footprints. > Can accommodate two 8K DOS's on a 27128. > Fits virtually all disk controllers.